Spring has finally sprung and I am longing for flowers and bright colours. I did this project a while back with Grade 3. This is a 3 session project, but that 3rd session is really short. - green paper, at school I ran the paper thru the shredder for stems. You could also just free hand cut them. Take your substrate, we are using canvas, prime if needed with gesso or white acrylic paint. I would only do this if I had marks or writing on it (recycled cardboard). 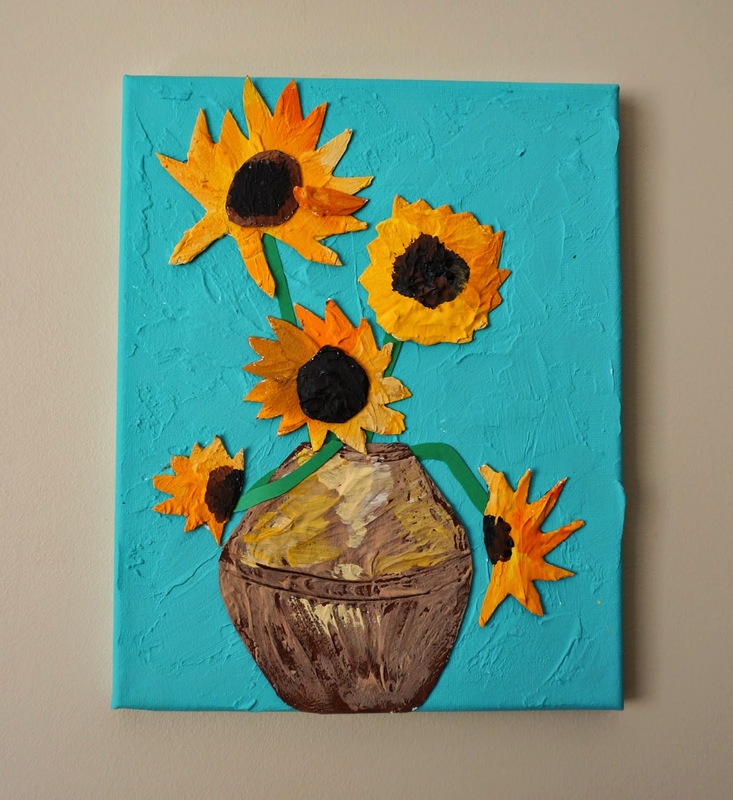 Using reference photos sketch out a vase and flower heads onto your recycled cardboard. Cut out. For extra dimension you can cut out some petals and flower centers. Spread some drywall filler on the substrate. You can use putty spreaders, old plastic gift cards, or just a scrap of cardboard. Add a layer of drywall filler to your vase shape and flower heads. Using a pencil or toothpick draw a few detail lines. I'm using an old knitting needle. Set all drywalled pieces aside to dry. It will take about 6 hrs. Take your canvas and paint with a nice acrylic background colour. Make sure to wrap your painting around the sides. You can also add a table colour in the bottom 3rd of your canvas. I did this with the students but not on my sample. It's up to you. Take your other drywalled pieces and paint with acrylic. It helps if you have a variety of colours. You can also just add a little black or white to make a tint or shade to give you some variation in the colours. For the vase I painted it brown first and then when it was dry I added some tan/white/yellow to make it look more like the original. I dry brushed it on. Now it is time for assembly. You can see the table colour in this student's piece. Using tacky glue and green paper for stems start gluing the pieces down. It helps if you lay everything out first on the canvas before gluing. It also helps to glue the vase on last to cover up the ends of the stems. At school I cut strips using the paper shredder. You could also cut them with scissors. This way you can change the shape a bit. Glue on some black beads for extra texture. Finally when the glue is all dry, seal with Mod Podge. The podge helps seal the drywall and prevent it from flaking. It also makes the piece pop with a nice shiny finish. I recently came back from my annual Maui break. I did lots of painting this year and I stuck to my guns and went computer free. Here is sampling of my work. This is on Front street just after the break. With this one it started to rain as I was painting but I got some cool texture happening in the sky from the rain drops. This is done in my bound sketch book, I just add colour but it's not wc paper so it's just a quick rendering. I did find this great little journal at the Barnes and Noble in Maui. It's Italian hand pressed paper and I love it. Takes longer to dry than my traditional wc journals but so much fun to paint it. This is a row of kayaks at Kapalua. I was reading 'Island' magazine while I was there and was inspired by a picture from Tobago. Love how the cloud bank turned out on this one. And this one I painted on the plane there in my sketch book using my Peerless Watercolours (I prep a travel palette thanks to Jane Davenport) and a really small wc field kit. Nice watercolors-I like the 'tiki' one and the boat best- Your Van Gogh project is cool with the 3-D look...Questions...do the kids have trouble or complain about cutting the cardboard? Is the dry wall filler ok for kids? not too smelly? 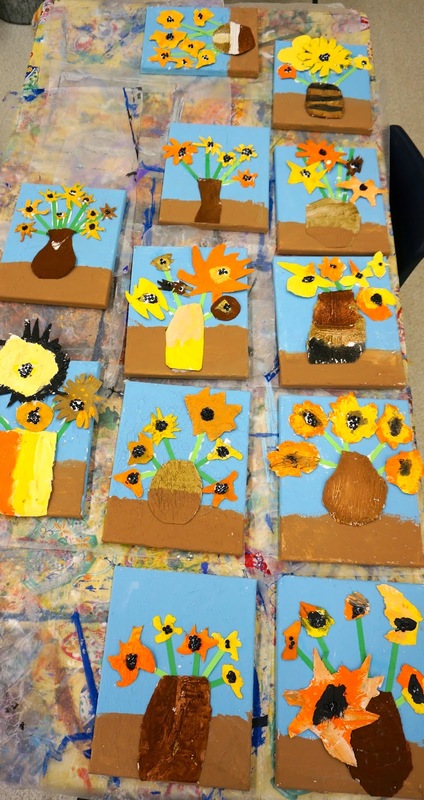 Hello, I tackled Van Gogh's sunflowers with my grade 3 students this year although I did it in a different way to you. The students are so proud of their work. I would love it if you had a look and left a comment.